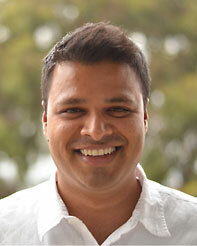 Sandeep Chandra is the Director for the SDSC Health CI Division and the Executive Director for Sherlock Cloud. Since joining SDSC in 2003, he has worked on different aspects of infrastructure deployment for scientific data management, as a principal investigator and in other leadership roles across a wide range of cross-disciplinary NSF, DOE, NIH and Foundation initiatives. As the Director of the Health Cyberinfrastructure division, Sandeep Chandra provides strategic vision, direction, management and implementation of concepts and methodologies for building Sherlock’s technology platforms. Sandeep brings strong knowledge of the healthcare ecosystem with deep focus in compliance including NIST, FISMA and HIPAA requirements. He led the deployment of Sherlock’s compliant services in AWS making it the first compliant, hybrid Cloud platform in academia. Sandeep holds as MS in Computer Science from North Carolina State University and has over 15 years of experience providing direct policy, business, operations, and technology advice to the leadership at federal, state and academic institutions.